Love living in Santa Fe. It has been especially nice to reconnect with classmates and make new friends as well. and Mikiah (11). Mikiah has a half-brother that also lives with them. Looking forward to many more times together. Along with my regular jobs I spent over twenty years playing for and singing in my church choir. I have retired from that since moving back to New Mexico. All the band and choir trips were a ton of fun. The best trip was to the World's fair in Seattle. Lots of other good memories of friends too.It has been wonderful to reconnect with classmates from Roswell. 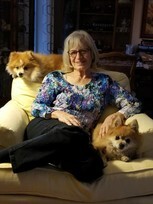 Diane Alley updated her profile. View. Diane Alley posted a message. Sara enjoy your birthday and especially your grandchildren. I have three grandsons from age 11 to 18. Being in Santa Fe is wonderful but it is way too far from Kansas City where my daughter and the boys live. Enjoy your special day and make it a happy birthday! Enjoy your birthday Susanne. Wishing you many more. Diane Alley added a comment on her Profile. Happy birthday Joe! Hope you enjoy your day. We need to have lunch again sometime. I think the last time was when Dianne moved Lubbock. Hope you get to be with your kids. I spent a month at Christmas with mine in Kansas City. Have fun! Diane Alley posted a message. New comment added. Happy birthday Robert. With all of the wind we are having you won't have to worry about blowing out the candles on your cake! We have too many anyway. Have fun with your family!!!!! OkJohn I hope you have had a wonderful birthday with friends and family to help celebrate. Wishes for many more!! Wishing you a happy birthday a few days early. It sounds like we have had similar experiences. I lost my mother in 2003 and both my brother and father in 2008. I hauled lots of family things back to Kansas City. I then decided to move back to New Mexico in 2015. I too do trailer trips and will continue to do that until I can't drive. Enough about me. Enjoy your special day. Happy camping! Happy Birthday Fred. Enjoy your day! Diane Alley added a comment on Danny Cathey's Profile. Diane Alley posted a message on Pat Sullins' Profile. Wishing you a happy birthday from up the hill in Santa Fe. Hope you have a wonderful day. Diane Alley posted a message on Patrick Riley's Profile. Wishing you the best on your birthday!